A great budget headset primed for Switch but useful for pretty much everything else. While limited on features and not as crisp in sound or surround capabilities as other headsets, you’ll be hard pushed to find a better one for the price. Expanding its healthy portfolio of headsets, Turtle Beach has another new entry this spring (out now in the US; May 31st for the EU). The Recon 70 addresses an area we haven’t actually seen that much action in: headsets aimed directly at the Nintendo Switch. The Recon 70 pitches itself as a go-to, budget option for Nintendo’s mobile console, while also offering compatibility with your other gaming devices. Straight off the bat, the Recon 70 has a striking resemblance to others in the Turtle Beach Recon headset range, though upon closer inspection the design is stripped back: a simple yet effective approach which, in turn, results in a lightweight headset. Comment-worthy features include slightly stingy headband padding and the oval ear cups’ synthetic leather, which feels a bit tacky, but it doesn’t feel cheap or breakable. As part of this dialled back design, there are only a handful of features that serve the Recon 70. First, and importantly, within the cups there are 40mm drivers to give you your gaming sound, while a simple volume dial on the left side controls the power of their output. Connectivity is simple and performed by a 3.5mm audio jack that’s on the end of short cable, very conducive to Switch and console controller plug in and play. The familiar Turtle Beach recon flip-down mic remains and feels sturdy enough but not as solid as other headsets mics. It’s tidy though - but it isn’t detachable. As an element of flexibility, the Xbox One variant - the Recon 70X, priced the same - offers compatibility with Windows Sonic so will make the most of this perk where appropriate on both Microsoft's console and for those using it with PC. The proof of a headset is in the pudding (well, listening), and I was keen to see how such a stripped back Turtle Beach headset performed. I began with a lot of Assassin’s Creed 3 Remastered - pertinent as its making a comeback on Switch in May, too - to see how the sounds of a single-player, story-based game would be presented by the headset. This enabled me to get a range of sounds from dialogue to gun shots (limited to 18th century muskets and rifles, of course), combat sounds, and world noises and audio cues. Generally the headset performed well but the level of audio detail was not as great as other headsets I’ve tested - real world sounds like wildlife and crowds seemed indistinct and there wasn’t any richness to dialogue, particularly - it felt a bit flat. However, it was certainly good enough for a couple of long sessions and, while it did lack some detail and overall richness, the volume level the headset offers meant I was still immersed in the game. Turning to Apex Legends next allowed me to test the Recon 70 in tense battle royale scenarios, where high-quality audio can turn a game in an instant. First off, the mic was great: reliably and clearly delivering my voice to my friends. Tick. All the game audio given to me was also, broadly speaking, good. The headset’s surround sound was decent, the weapon noises were punchy, the audio cues, such as pings, and the general noise of battle, were clear enough to keep me informed and alert. The surround sound was not the most seamless I’ve experienced and there, upon a little closer inspection, seemed to be a distinct line between left and right side audio - not seamless, or having an unidentifiable transition which is the case with other headsets. Generally, it was fine in a battle royale setting but I certainly felt that its lack of audio detail was noticeable: where headphones of a certain standard can directly impact your playstyle, the Recon 70 didn’t really have that power. Turning away from multiplayer games, I flitted between Doom and Divinity Original Sin 2. Going between such titles gives me a great comparison and range of in-game audio and soundtracks to analyse headsets with, from a bottom-heavy game to a top-heavy, dialogue-filled title. Doom’s crunchy weapons and combat noises combined with Mick Gordon’s booming, metal-centred soundtrack, was handled pretty well by the Recon 70 headset. However, if there’s one thing all gaming headsets seem to love, it’s explosions and metal. It was enjoyable here, though the lack of audio detail and richness was again present. The medieval-esque, dialogue heavy soundtracks and audio of Divinity Original Sin 2 was handled less well by the headset. Audio details again were lost, and there was a distinct lack of fullness in the dialogue and music. Having been alerted to the minimal padding when I first took it out of the box, it was not necessarily a surprise that after longer play sessions, the Recon 70 started to become a little uncomfortable. The initial tightness and secure feeling the headset gives can later change to achy discomfort. So it's perhaps most ideal, comfort-wise, for short-to-medium sessions that may well come naturally to Switch players’ use of the console while traveling or commuting - and on that note it would certainly suffice for some light radio or video use if you’re not too fussed about having the best sound quality and richness for these media. This is a fine, budget headset and if you’re looking for a companion to your Switch that you won’t be too precious about, or are limited by a small budget, then this would be a good acquisition. 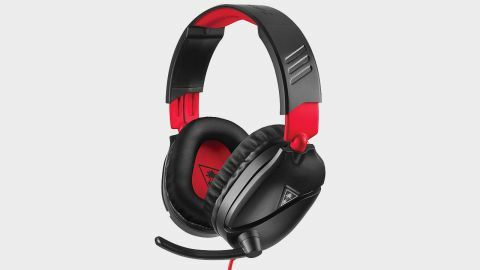 To clarify completely though, if you were eyeing it up as your main or only gaming headset then I would probably encourage you to stretch your budget and aim for something further up the price and quality scales such as the Creative BlasterX H6 or the Razer Kraken - even the Turtle Beach Recon 200 is worth a look. However, there are certainly some circumstances where the Recon 70 would be an excellent acquisition, like having a headset for travelling that you wouldn’t be too concerned about getting knocked or buffeted by the rigours of the commute, or as an excellent stopgap headset while you save for another. It’s a pretty good gaming headset, and while it does have shortcomings, these are all tempered by the fact that the Recon 70 is only $40 / £30, and so does offer decent value, overall.